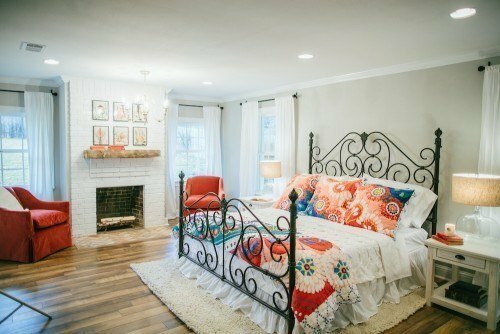 The casual, rustic look in Fixer Upper Style Bedrooms is easy to achieve with my copycat sources! 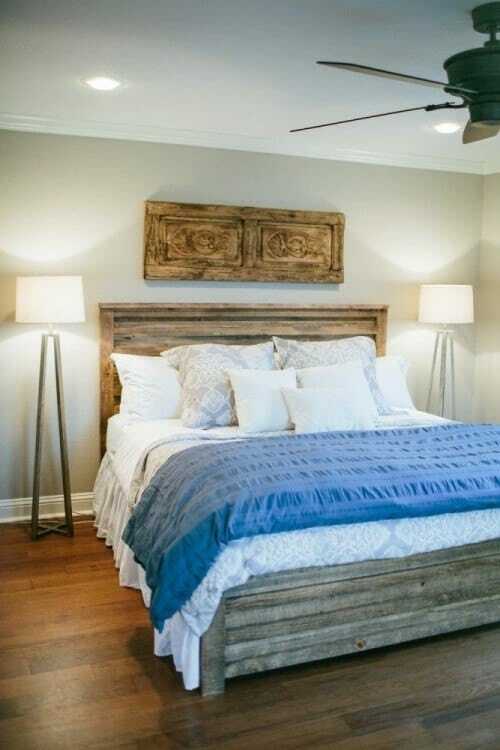 Are you ready to get the Fixer Upper bedroom of your dreams? Time for more Joanna Gaines Fixer Upper Style as I’m back with my third installment of “Fixer Upper: Get the Look”. I’ve already shared with you my shopping guide for Fixer Upper Living Rooms and Kitchens so today it’s the bedroom’s turn! Again, I’m sharing favorite Fixer Upper bedroom makeovers as well as the copycat items that I’ve found to help you recreate each room. By now, we all know that Joanna Gaines likes to stick with white, gray, blue/grays and greiges for most of her spaces. If you’re afraid of color – or are new to the decorating game – these colors are super easy to work with. Pair with other similar shades (including beige, off-white and anything wood-toned) and you’re good to go. Tip: Looking for a similar paint color? This wall appears to be one of Joanna’s favorites – Repose Gray by Sherwin Williams. I’m sure I’ve said this before but adding some sort of natural element to a space really helps to pull it together. I like to call this “grounding the space”. Whether it’s a wooden headboard, a natural jute rug or even just a fiddle leaf fig in the corner of the room, these natural elements add the finishing touch. In this space you will notice the use of reclaimed wood and metal lamps. To stop it all looking a little too “brown” a blue seersucker duvet and printed bed-linens are added. The jute rug, greenery on the dresser and even the wood tones in the arm chairs help to ground this space and bring a cohesive look. Having a variety of textures is important in every space- but even more so in the bedroom. This room needs to immediately feel warm and inviting and beckon you to the bed! Joanna loves to use texture and color in her drapery, bed linens and accent chairs. In this particular space she chose a heavily textured duvet and shams along with a scalloped headboard. Tip:Looking for a similar paint color? Try Mindful Gray by Sherwin Williams. It’s the darker sister of Repose Gray. Even if you’ve stuck to a neutral palette in the rest of your home, adding a bright pop of color in your bedroom can be really fun. You don’t have to worry about it being as cohesive as it would need to be in the open spaces of your home because usually the doors to your bedroom are closed! Here, Joanna totally transformed a neutral space with bright red accents – and it looks amazing! Tip: A great shade of gray for any room in Gray Owl by Benjamin Moore. It works with most spaces and has minimal undertones. Liked this? Make sure you check out my Living Rooms and Kitchens Guide for getting the Joanna Gaines Fixer Upper look. Great ideas! I really love how inviting all the bedrooms look. Designing a room you truly relax in can be difficult, but you came up with some really fun ideas.